Looking for a new assignment for one of your math classes? I have created this assignment in an attempt to have students become more passionate about math and to see a connection to the real world. In short, this assignment requires students to create a 1-page fact-sheet or Power Point presentation on a particular math career. 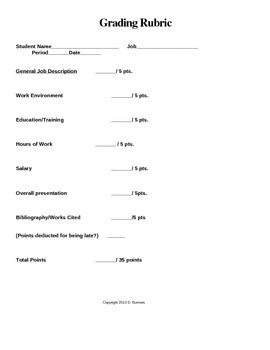 (51 Printable careers are included) Each student in the class completes their own report and then reports back to the class on their findings. When I am done with all of the reports I try to have some of my friends who are engineers, actuaries, etc. come in and talk to the class about their actual jobs. Even if you don't have any guest speakers the kids usually end up enjoying this assignment. Most people don't know about career options other than the typical doctor, lawyer, teacher, etc. This assignment could be used for any grade but I find it to be very appropriate for my 8th graders who are transitioning to the high school next year. It is good for students to have an idea of what they like (and don't like) going into high school scheduling. If you are looking for more creative resources please check my other listings. If you find this assignment to be useful I would appreciate any feedback you would be willing to leave. Thanks and happy teaching! 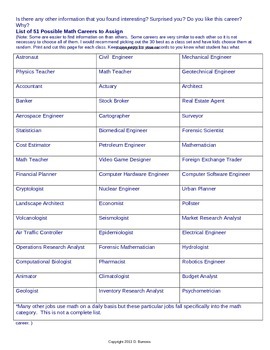 Math Career Report by Dana Burrows is licensed under a Creative Commons Attribution-NonCommercial-NoDerivs 3.0 Unported License.